Get fit, have fun, raise money for some unfortunate people who really need it. 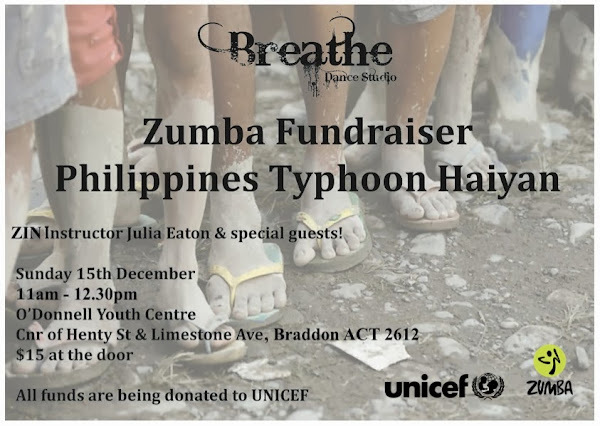 Breathe Dance Studio will be holding a Zumba charity event to be hosted by Zumba instructor Julia Eaton (and some special guests) on Sunday 15 December with all proceeds to go to Unicef. The event will be held at the studio (the O’donnell Youth Centre, cnr Henty and Limestone Avenue) from 11am-12:30pm. Tickets will cost $15 on the door. Breathe Dance Studios is a dance school started and run by an incredible local dance enthusiast by the name of Alex Ewens, and they want to help you dance better, and help some people live better, so go support them.